There have been many International 11 Days programs, along with local cooperation throughout the world. The programs have focused on positive themes such as peace, unity, human rights and freedom. From September 11th through the International Day of Peace on September 21st, there are 11 Days. Carbondale's first 11 Days project followed that timeline. We have found that a community focused on one concept for 11 Days shines a spotlight on our community's existing efforts, prompts dialogue, and inspires new initiatives. WE is a Consciousness, a Campaign, and a Collaboration of people, organizations and social change movements from around the world. The 2013 WE campaign is 11 Days of Global Unity. The International Day of Peace was first established by the United Nations in 1981. The International Day of Peace is now observed around the world on September 21st as a day devoted to strengthening the ideals of peace, both within and among all nations and peoples. The 11 Days for Compassion was a series of events that took place from May 1-11, 2012 in the Carbondale community to explore the idea of compassion. Inspired by the Charter for Compassion and Karen Armstrong's book, 12 Steps to a Compassionate Life. Nonviolent Carbondale has partnered with the Carbondale Public Library to organize eleven days of events hosted by various community groups and agencies. Watch videos about the Charter for Compassion here. We celebrated in 2013 the coming of spring with "11 Days for Food Justice," February 21 - March 3, 2013. Multiple community events explored where food comes from and all the steps and missteps it takes to get to our table. Learn about Food Justice resources here. The Carbondale Public Library, in partnership with the Carbondale Human Relations Commission and Nonviolent Carbondale, was awarded a grant: Building Common Ground: Discussions of Community, Civility and Compassion, from the American Library Association and the Fetzer Institute to provide funding for the 11 Days for Compassion. 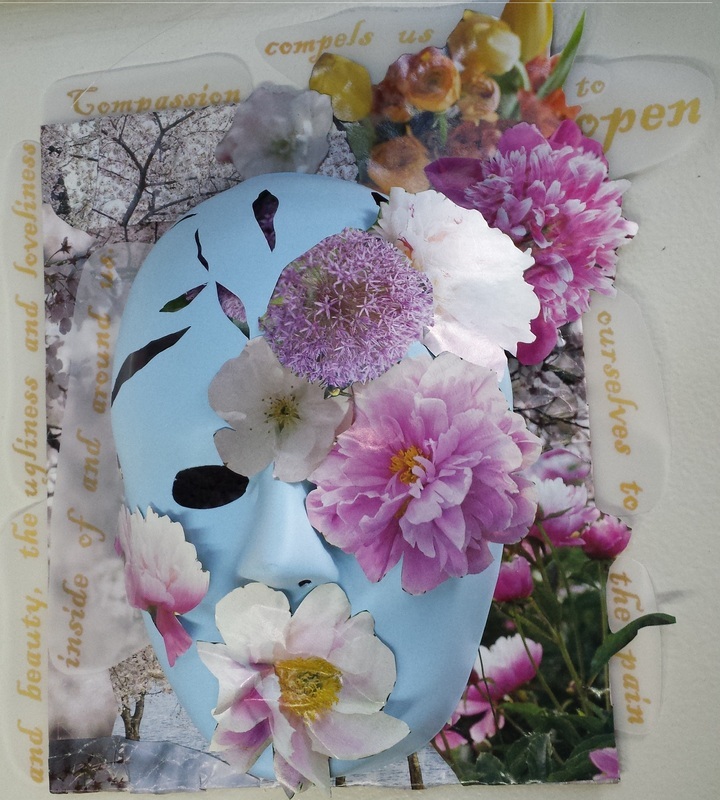 The 11 Days For Compassion was originally inspired by a student art exhibit featuring masks in Quigley Hall at SIU, a project led by Associate Professor Peter B. Smith through the SIU School of Architecture . This was in the fall of 2011 when the Faculty Association was on strike and Occupy Carbondale was camped out on campus. Both events evoked a wide range of passionate commentary. Meanwhile, as conflict played out on campus, the mask exhibit in Quigley Hall showed a diverse community of faces. Walking through the exhibit required the viewer to dodge sideways at times, to confront and negotiate with the sea of faces, to view the individual masks, and the community of faces as a whole. The relevance to the current situation seemed both subtle and obvious. We thought: What if we use art and dialog to face each other; face ourselves; and face our future as a more compassionate and civil community? Like the Roman Janus mask, our purpose was not only to look back, but to look forward. We did not wish to limit this project to an examination of one point in time in one location. We wanted to examine how our entire community can face one another with compassion, even in situations where we disagree. Thus, the 11 Days For Compassion featured a variety of programs and events: book discussions... videos...developing a plan to officially become a Compassionate City...and there were mask displays, and many opportunities for mask-making. 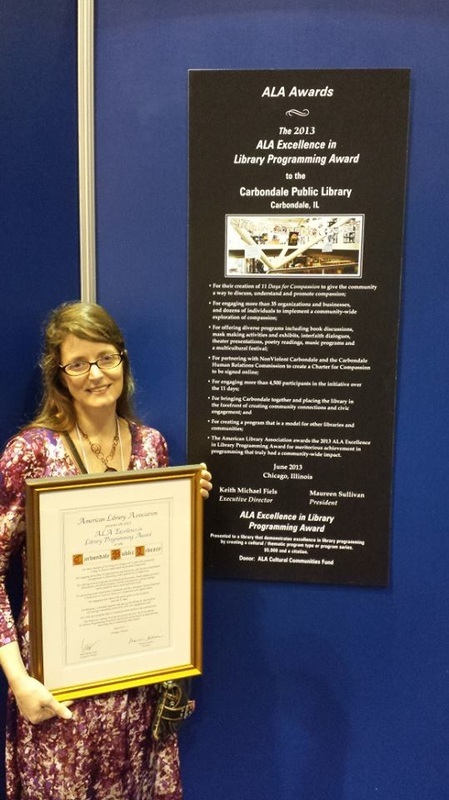 In 2013 the Carbondale Public Library was awarded an Excellence in Library Programming Award for their leadership in 11 Days for Compassion. The honor goes to all of the organizations and individuals who planned the 11 Days, led activities, and/or attended the activities. The library has set aside the $5,000.00 award for similarly themed community activities. number of community groups sponsored various peace-related events throughout the city of Carbondale for eleven days starting September 11 and culminating on September 21, the International Day of Peace. Nonviolent Carbondale facilitated planning meetings for this "11 Days for Peace," which included over 25 events hosted by various individuals, groups, and agencies and attended by over 1,000 community members. View the 11 Days for Peace brochure with event listings: Page 1 and Page 2. 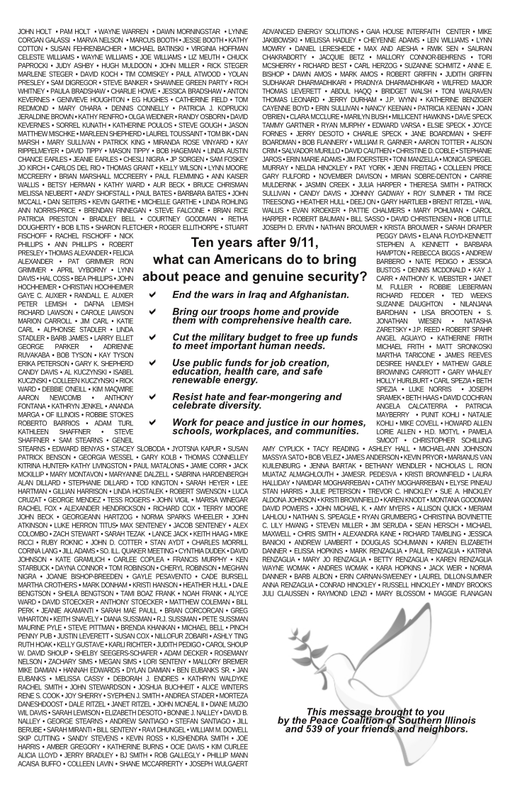 In collaboration with the Peace Coalition of Southern Illinois, Nonviolent Carbondale promoted a message of peace accompanied by 540 signatures that was published in area newspapers. View the full-page ad below or here.